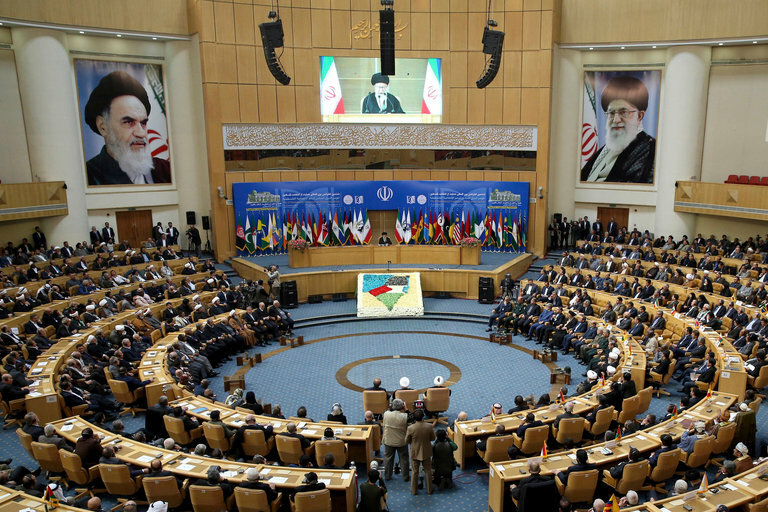 A session at the International Conference in Support of Palestinian Intifada in Tehran on Tuesday, where Ayatollah Ali Khamenei, Iran’s supreme leader, urged renewal of the Palestinian uprising, or intifada, against Israel. The theme for this year’s gathering was “All Together for Palestine.” Prominent seatings were reserved for the heads of Parliament for Zimbabwe, Tanzania and Syria, as well as the leaders of Islamic Jihad, Hamas and the Lebanese group Hezbollah. All three of those groups are considered terrorist organizations by the United States. Iran’s support for them is one of the main reasons the White House has, for years, and particularly now, in the Trump era, labeled Iran perhaps the biggest state sponsor of terrorism in the world. In Tehran, however, the groups are revered as freedom fighters battling a Western-backed colonizer. All three have offices in the Iranian capital and all have received money, intelligence and even weapons from Iran — at least in the past. On Monday, the evening before the conference, Iranian state television broadcast an hourlong interview with the leader of Hezbollah, Hassan Nasrallah, who warned that his organization was capable of striking Israel’s nuclear facilities. Speaking in Iran’s cavernous Islamic conference hall, Ayatollah Khamenei ticked off a series of viewpoints that have been standard fare since the Islamic revolution of 1979. In essence, they consisted of exporting their ideals, uplifting the poor worldwide and giving full state support to the Palestinians. “The issue of Palestine can, and should be, the pivot of unity for all Islamic countries,” the supreme leader told his audience, which also included guests from Germany, Wales and Suriname. Unfortunately, Ayatollah Khamenei said, some crises in other countries in the region have “caused support for the issue of Palestine to be undermined.” Presumably he was referring to the civil wars raging in Syria and Yemen. 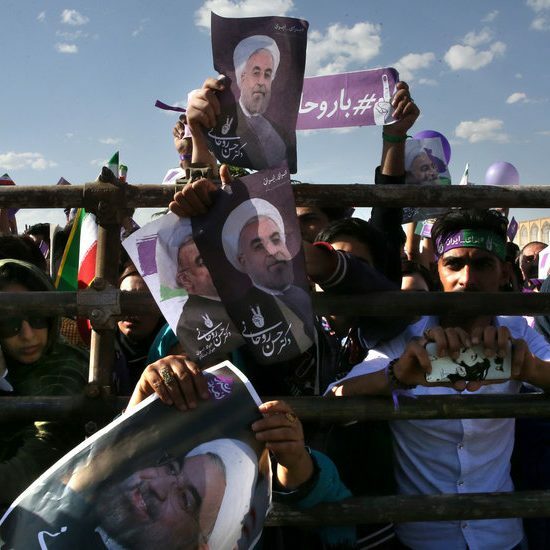 Iran’s ossified ideological stances, including those on Palestine, have put it at odds with other states in the region, particularly Saudi Arabia, which over the last decade has lost some interest in the Palestinian cause. 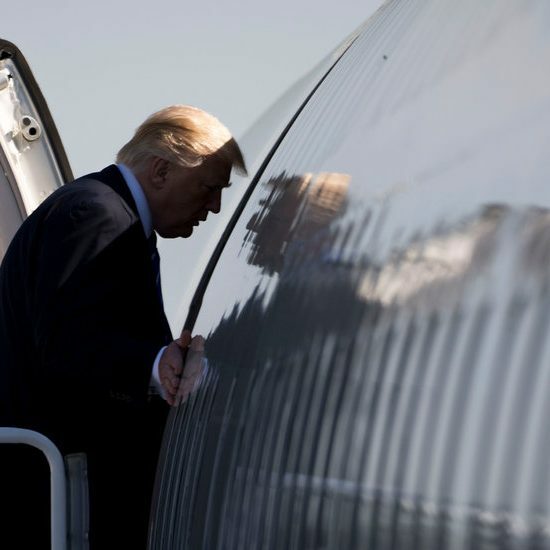 Last week, the Trump administration hinted at a coalition among Israel, Saudi Arabia and other Arab countries that he said would counterbalance Iranian influence in the region. That, analysts say, has raised concern levels in Tehran. But in the conference room, everything was about Palestine. The speaker of the Zimbabwean national assembly, Jacob Francis Mudenda, lauded the Iranians for their support of the Palestinian cause. He highlighted his own country as an example. “We have lived for a hundred years under colonialism, and we freed ourselves — Palestine can too,” Mr. Mudenda said, accepting applause from the other delegates in the room.